If you’d like your manager to use Lead Honestly, we’re happy to help make it happen. We provide tools to schedule, curate, track, and optimize 1-on-1 meetings. Routine 1-on-1 meetings with your manager provide you with the opportunity to discuss how you’re feeling, give and receive feedback, and build a stronger relationship. To assist you and your manager, we’ve built an intuitive and helpful 1-on-1 meeting application. Share your managers’s name and email address with us and we’ll kindly send them an email, telling them about Lead Honestly. We promise to be kind and respectful. In fact, you may see the email we’ll send your manager below. Thank you for your interest too, we sincerely appreciate it. If you prefer to share Lead Honestly yourself, please feel free to use our email. <your name> thought you may like to know about Lead Honestly. Lead Honestly helps managers and employees engage in 1-on-1 conversations and build stronger relationships. As with <your name>, we’d love to see you give it a try too! 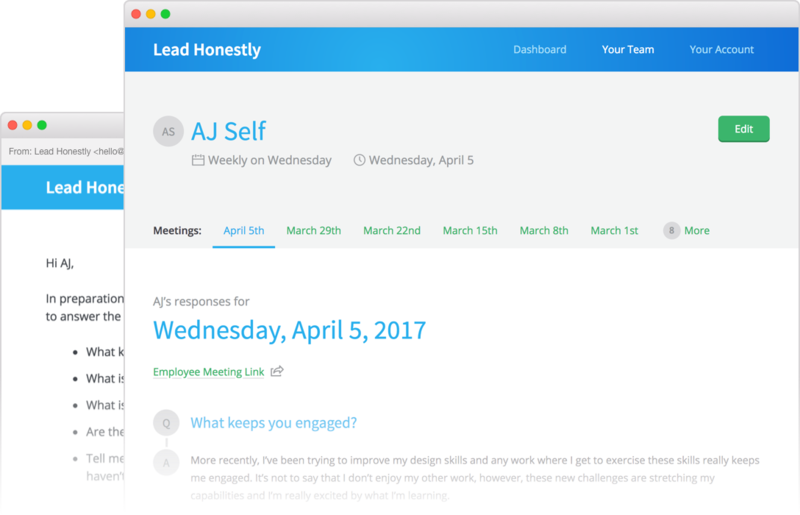 In a nutshell, Lead Honestly sends curated questions to your employees, tracks and notifies you of their answers, and helps you prepare for meaningful 1-on-1 conversations. In addition to building stronger relationships, these conversations allow you to learn about and identify potential problems early on. This knowledge then leads to solutions instead of crisis management. We hope you find that Lead Honestly is truly worth your time and money. If you have any questions, please feel free to contact us at [email protected] any time.